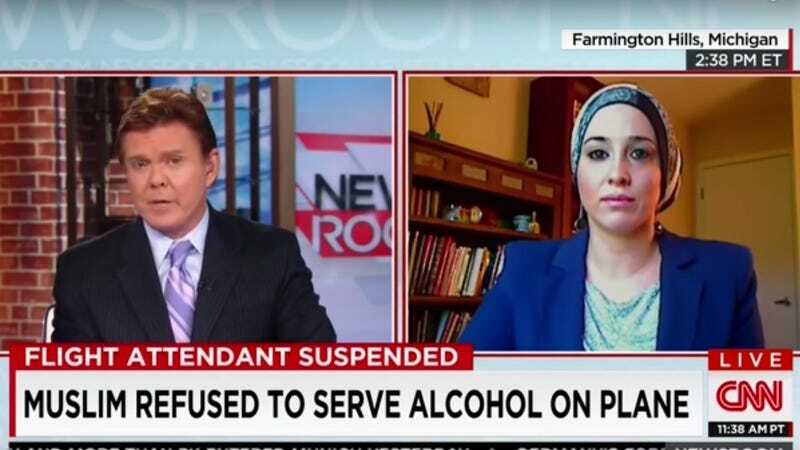 Charee Stanley, a Muslim flight attendant who refused to serve alcohol during an ExpressJet flight, is now fighting to get her job back. Two years ago, Stanley converted to Islam, a religion that forbids believers to drink or serve alcohol. In June, she worked out an agreement with her employer that allowed her to do something else while alcohol was served by her fellow flight attendants, and everything seemed to be fine. However, according to the Huffington Post, despite that agreement, one of Stanley’s co-workers filed a complaint against her for being “delinquent in her duties” for not serving liquor in August. Lena Masri of the Council on American-Islamic Relations’ Michigan chapter, Stanley’s lawyer, says her client is open to mediation but if a resolution isn’t reached, they are not afraid to sue ExpressJet. Despite the small similarities between Stanley’s case and that of crazy person Kim Davis who said Christianity barred her from doing her job of handing out marriage licenses, Masri says they’re incomparable.